We will explore how to set up a Google My Business listing, maintain the listing, and how to optimize it appropriately for excellent Knowledge panel results. If you’re not monitoring this information, you run the risk of losing out on new customers. Make sure you are signed into the account you want to use to manage your business page. 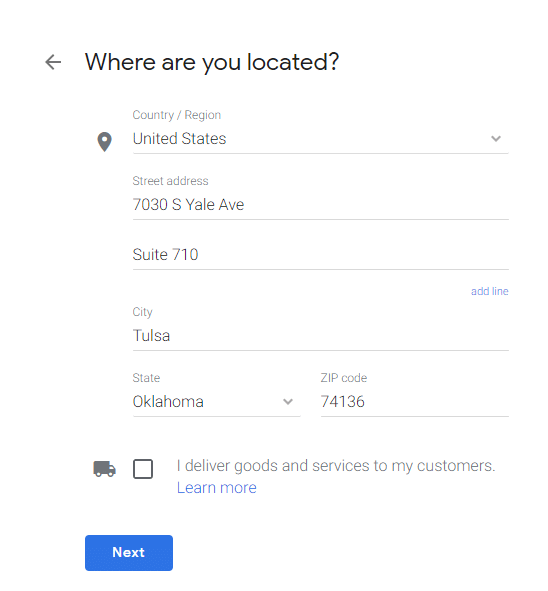 *If* you do not have a brick-and-mortar location, but provide a service at the client’s location (like a plumber or electrician), you will select “I deliver goods and services to my customers.” By selecting this option, you eliminate your physical address from being displayed in the knowledge panel and instead inform your potential customers where you are available to serve them. Upon clicking “Finish” on the next page, you will be asked to verify your business. Verifying your business can be done by phone, mail, or email depending on which options are offered by Google. Many times, businesses create their listing and think they are done and forget about it. Monitoring your listing is essential for your success for several reasons. You want to make sure the information is up-to-date and accurate for your current customers and potential new customers. If your business closes at 5 pm, you don’t want your listing saying you close at 6 pm for obvious reasons. Photos—the photos displayed in this section are both uploaded by the business and user-generated (ever see the “You’re at X, take a photo for Google” notifications on your mobile device? This is where those photos may appear. Exterior Photo—this photo is clickable and takes users to Google Street View of your business. The image that appears here is largely outside of your control. Map—when clicked, this takes the user to the Maps Knowledge Panel where they can see the pin of where you’re located. Website button—takes users to your website. This will count as an organic user/session. Direction button—takes users to the maps widget to receive directions to your location. Be sure to check the directions for your location to make sure they are correct. Review stars and count display—here is where customers can read reviews about your business and see the average number of stars received. Hours—a drop-down displays the week’s hours when clicked on. Suggest an Edit Option—this is where users can suggest edits to your business data. Malicious competitors could use this option to sabotage your listing for customers which is the reason we suggest monitoring your listing regularly. Know this Place?—this feature enables anyone to contribute information about the place like whether you offer on-site parking or if there is a cost to park, etc. Q&A—users can post questions about your business as well as answer questions posted by others. Write a Review—the button for users to add their reviews to your listing along with a star rating. Add a photo—Users can add photos to your business using this function. That is a lot of information that you can present to customers. You may be thinking to yourself “how can I prioritize this information for the best impact for my clients?” Remember, you can’t just follow a checklist to optimize your knowledge panel in the best way for your personal business, but there are ways to maximize your return from the information present in your panel. Images: Since these can be uploaded by users as well, check in to make sure the photos reflect the style of your business. Report photos that fail to meet Google’s requirements or that you do not like. Posts: Think of the posts as a micro-blog. If you have a special running or are trying to drive traffic to a specific webpage, this is a perfect way to do it. Finally, remember to create positive real-world experiences for your consumers. Positive experiences lead to positive reviews which could lead to more conversions to your product or service. This is a lot of information to take in and understand. 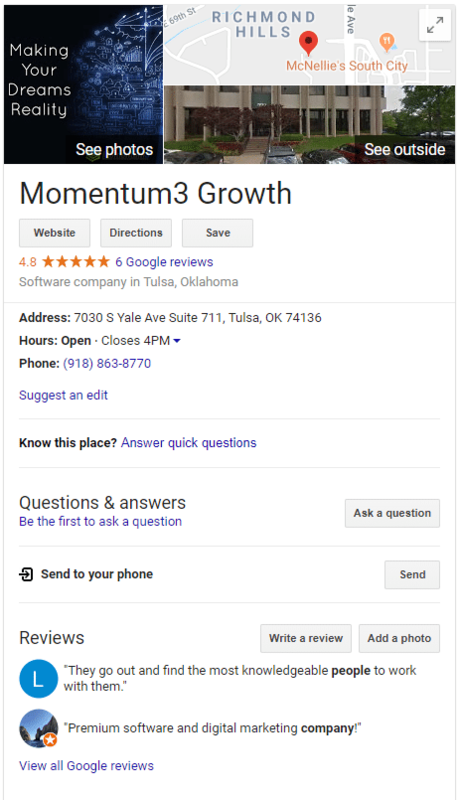 Hire our pros at Momentum3 Growth today to help you create and monitor your Google-My-Business listing and Knowledge Panel. We are equipped to set up listings, edit them for accuracy, monitor them for edits made by users, and monitor your reviews. We offer reputation management services as well. 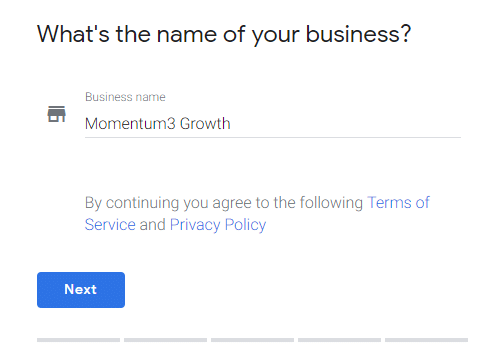 Momentum3 Growth is ready to help you understand your Google listing and use it to help your business succeed!